Skip the Cheez Whiz-provolone debate and take Philly's most iconic sandwich into your own hands. Sometimes, mimicking restaurant food at home means submitting to trial by sticky pizza dough, with a sentence of splattering refried beans. But when you stumble upon a restaurant dish that a short-order cook or street vendor can make start to finish in just a few minutes, it’s a sign that the translation to homemade won’t be so rife with pitfalls. That’s the thing about a cheesesteak. While you’ll never recreate the personality and grease-glazed sidewalks of an actual cheesesteak stand, the hoagie itself travels beautifully to the home kitchen. You cook onions, you cook steak, you melt cheese, and you pile it all onto a roll whose final flavor is perfectly situated between sweet, salty, and just plain rich. The whole thing takes 15 minutes start to finish—if you don’t count the 20 minutes of debate about Cheez Whiz. Pro tip: Be mean to the people you’re eating it with. Or maybe you can just skip the debate altogether—and not because there’s a clear and obvious winner emerging from the muck of cheesesteak history. See, the home kitchen is a place that lacks the mandates and staunch opinions of the traditional stands, which is good for Philadelphia expats who crave an impossible-to-find cheesesteak, but bad in a non-culinary sense, if you ask professional cheesesteak eater Carolyn Wyman, author of The Great Philly Cheesesteak Book. “Some of the flavor [depends on] where you get it,” she says. 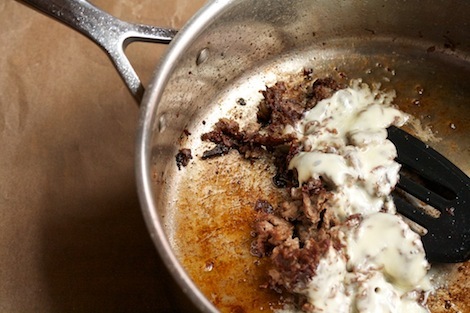 So once you’ve mastered the parts of the famous, beloved, and controversial sandwich, you’ll probably want to adopt the characteristics of your favorite cheesesteak cooks. For example: “Be mean to the people you’re eating it with,” suggests Wyman. If that’s impossible, at the very least, wrap up your cheesesteak in paper, carry it outside, and let the grease drip, authentically, onto your shoes every time you take a bite. The power washers will be around to scrub the sidewalks of grease later. Oh wait, that’s only in Philly. 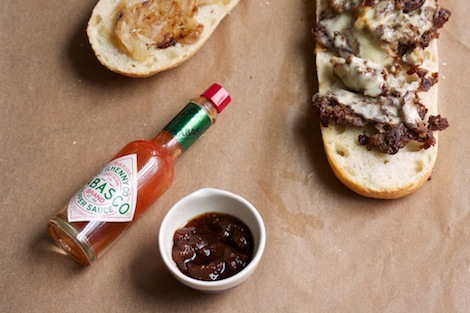 Here’s how to make a cheesesteak—the best-ever sandwich of meat, cheese, bread, and onions—in your own kitchen. Forget the steak and the cheese—Wyman says it’s the bread that’s the most difficult to find outside of Philadelphia, where demand for cheesesteak hoagies helps to fuel the local bakery industry. 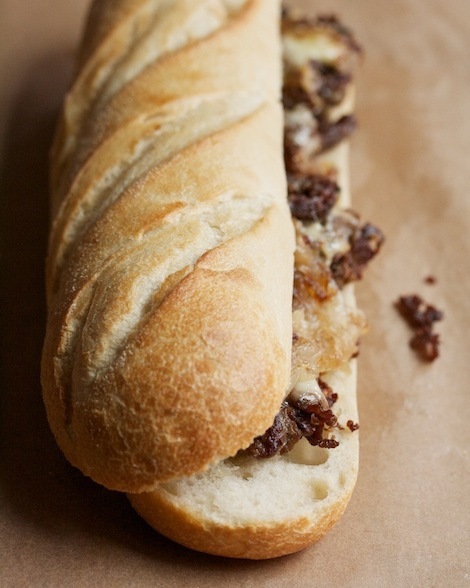 In fact, the entire tradition of cheesesteak-making came up out of the Italian rolls prevalent in the city. There was bread, and eventually people decided there should be steak, and later cheese, on the bread. The right bread should be fresh, large, and slightly dry—“almost cottony,” says Wyman. While the hoagies rolls have to be sturdy enough to withstand a pour of hot grease, they should be soft in the middle for easy eating. 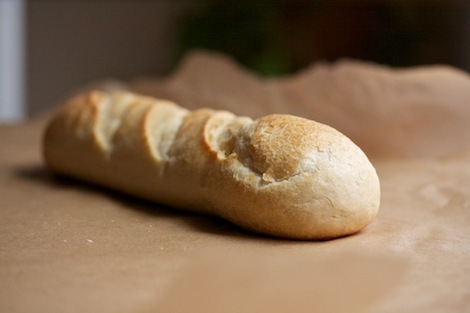 I found that a small New York City supermarket baguette that wouldn’t pass muster as an actual baguette sufficed as an okay substitute for the real thing. In Wyman’s book, you can find a recipe for making the right rolls from scratch—and there’s not even any Philadelphia tap water in the ingredient list. Thinly sliced and quickly sautéed onions sweeten and balance the cheesesteak. At cheesesteak stands, there’s pretty much always a pile of onions cooking on the side of the griddle, ready to be thrown on top of the meat when an order comes in. 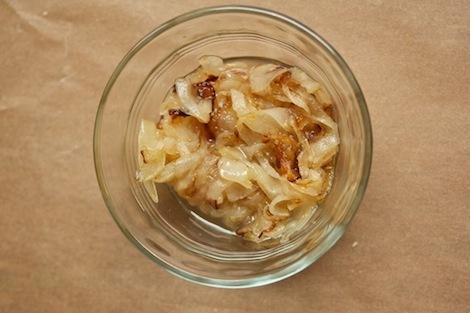 You’ll see a bit of variety in the onions: Some stands are renowned for stewed onions; some chop them thin, some thick. Here’s a part of the sandwich you can put your own spin on. 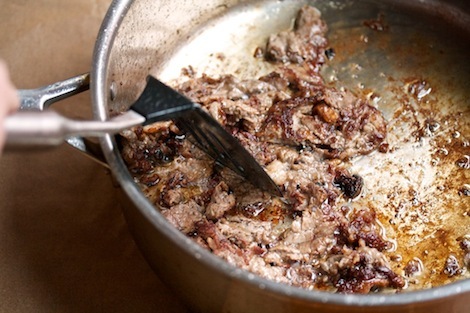 If you’re making just one or two steaks, cook the onions just before the meat; if you’re doing cheesesteaks for a crowd, cook your pile ahead of time. Allow about half of a small onion per sandwich. Cut the onion as thinly as possible—a mandoline is best if you have one. Heat your largest skillet or griddle over high heat until it’s really hot. Then add a decent amount of oil to the pan and turn it down slightly, to medium high. Add the sliced onions and cook, stirring almost constantly, until they’re quite brown and very wilted, yet not totally caramelized. Sprinkle them with salt and then either push them to the side of the pan or remove them to a bowl while you make the steak. While most of our meaty comfort-food gems, from meatballs to burgers, repurpose cheap ground meat, cheesesteaks traditionally use pricy, delicious rib-eye—which seems a bit strange until you experience how the marbled meat dissolves in your mouth. If you want to cut costs slightly, you can use top round like they do at Jim’s; or, if you’re desperate, you can look for a product called Steak-umms in the freezer section—they’re shaped like sliced beef but really made from something more like hamburger. You’ll want a generous quarter-pound of meat per sandwich. 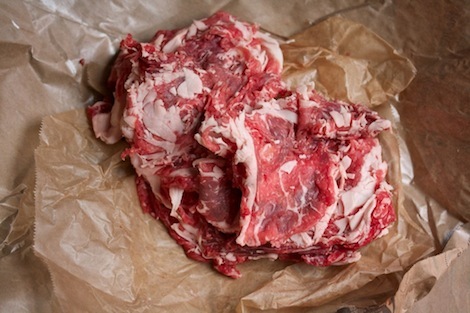 To prepare the meat, your next challenge is to turn a whole rib-eye steak into thin slices. You want each slice cardboard thin, not paper thin, so if you’ve got a butcher, definitely opt to have the meat cut when you buy it. If not, try freezing the meat for an hour or so to firm it up before using a sharp knife to cut your slices. The thin meat cooks incredibly quickly, which is part of why the cheesesteak is a good at-home, last-minute dinner. To stay on top of things, get the bread, onions, and cheese (more on that in a moment) all ready to go once you start. Then you want a hot pan and the biggest cooking surface you’ve got. After you’ve cooked the onions, add another film of oil to the very hot pan and throw in the steak slices. Salt while you cook, letting one side brown before flipping the pieces over. You’ll likely cook less than 2 minutes per side. And here we come to a cheesesteak point of contention. Some cheesesteak stands—including my butcher’s favorite, apparently—chop the steak into smaller pieces while the meat is cooking. 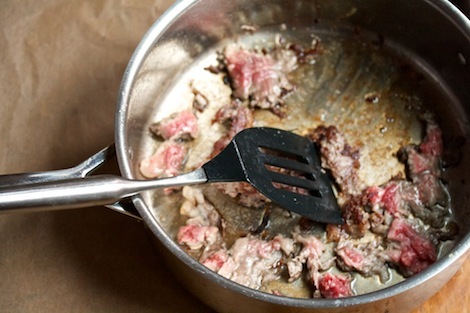 If you’d like to do this, just use your spatula to break the meat up right in the pan. But, be warned: “You ask for it at a place that doesn’t chop at your peril,” says Wyman. 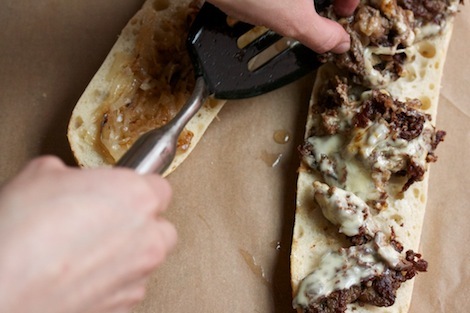 Avoiding intimidation is just another reason to cook up a cheesesteak your way at home. Next up: the cheese problem. You’ve probably heard all kinds of things about the war between the provolone lovers and the Cheez Whiz fanatics. 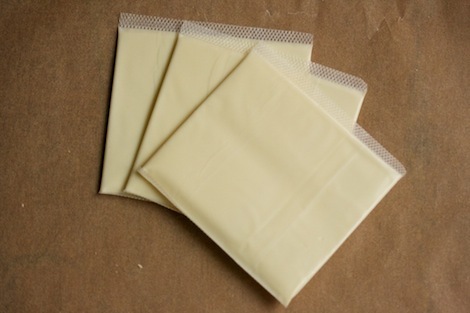 And while it’s true that some joints won’t do Whiz and others won’t do prov, Wyman assured me that there’s a little-known but very popular middle ground: white American cheese slices. Not as profoundly low-brow as processed cheese dip, the slices also preserve the perfect harmony of a good steak. “Whiz has its own strong flavor, as does provolone,” says Wyman, which goes against the nature of a sandwich that, at its core, is supposed to be balanced. If you notice the cheese to the exclusion of the meat, cheese, and onions, Wyman’s argument goes, you’re doing it wrong. At least this much is simple: For sliced cheese, grab 3 slices for every quarter pound of meat and throw them up top of the steak as it finishes cooking, while it’s still in the pan. This allows them to melt; if you want extra meltiness, cover the pan for 30 seconds before assembling the sandwich. If you’re using Whiz, warm it separately, in a small pan or in the microwave, then spread onto the meat once you’ve assembled. Cut the hoagie roll in half almost all the way through, then scoop the meat and cheese right from the pan onto the bottom half, being sure to get a substantial portion of the grease from the pan into the sandwich (spoon on a little extra if no one is watching). Spread the onions on the top half, then fold the sandwich together. “There are a few acceptable toppings,” says Wyman. These include peppers—from long hots, to hot-pepper relish, to quick-cooked red peppers. In various outposts of cheesesteak country, fans might also include mushrooms, pizza sauce, ketchup, hash browns, and A1 steak sauce to that list. But acceptable doesn’t mean necessary or even good, says Wyman, so stick to the four essentials if you can. Cut the cheesesteak in half and then take it outside. A cheesesteak is best eaten out in the open, grease dripping onto your elbows, shoes, and sidewalk, says Wyman.